Improv Theatre Company | Sydney Australia's boutique long form improv training company. We get long form, it's in our DNA. We’re very excited to present an improvisation workshop that‘s a little different. On Saturday 11 November 2017, international guest teacher Omar Argentino Galván will present his popular Impro Big Band Assembly workshop for multiple artistic disciplines, based on the groundbreaking Soundpainting techniques of Walter Thompson. Come and learn some of these unique directing and performance techniques, and participate in what is effectively part workshop and part improvised multi-disciplinary artistic event, for dancers, singers, poets, improvisors and musicians. While this workshop is primarily for improvisors, if you play an instrument as well then please bring it along. If you can dance, then make sure you bring your feet. Where will you say you were, on the day Omar Argentino Galván came to town? Originally developed in the 1970s and 80s, Walter Thompson created a sign language of more than 200 gestures for composing music in real time with improvising musicians, which he later adapted for other domains such as dance and acting, with audience participation and reincorporation/callbacks. Omar has taken this even further for theatrical improvisation (impro/improv)—improvised scenes, with music, singing, soundscapes, dance and audience interaction. Who is Omar Argentino Galván? Omar Argentino Galvan is based in Madrid, and has been touring his improvisation workshops around the world since 2000. His work is characterised by poetic scenes and a magical realism and theatrical narrative not often used in theatrical improvisation. This is his first trip to Australia, and he’ll only be in Sydney for 3 days. This is the only workshop he’s giving. This entry was posted in Courses, Events on 26 October, 2017 by Richard Bennett. This workshops is no longer available. 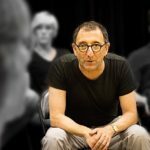 Master improvisor and teacher David Razowsky returns one more time to Sydney in late October to present two specially selected workshops. A master improvisor and teacher of theatrical improvisation and acting, David is the most experienced Chicago improvisor ever to teach in Sydney. His first visits to Sydney a few years ago had a huge impact on the community, and this visit will do the same. These will be the only workshops David is doing in Sydney, and will sell out quickly. David will be giving a full day workshop on Sunday 29 October 2017 consisting of two of his classic workshops: change and the Jerry chart, and sharpening your point of view. This is an amazing opportunity to work with David consistently over a full day. Revelations. A scene doesn’t change unless someone in it changes. How do you know you’ve changed, and how can you spot an emotional change? Get in touch with that inner alert that tells you it’s time to take the next step in the action. Sharpen your Point of View. The very first exchanges of your scene tell you all you need to know about who you are and where to emotionally and energetically go. Are you aware of that? Are you listening to yourself at that time? This workshop will guide you to your point of view, and have you following yourself confidently, bravely, excitedly, and easily. It’s as simple as that! David will also be giving a 3 hour evening workshop on Wednesday 25 October 2017. Expose your UnderWhere. One of the first things to escape you when you hit that stage is your “where,” the objects around you, and, well, you know why: because you’re thinking about “where to put things.” This workshop’ll connect you to everything that’s already there, freeing you from thinking and encouraging you to see, helping you explore relationships and create characters in ways you’ve never done before. The full day workshop is $249 INC GST, and the evening workshop is $129 INC GST. We’re also offering a 15% discount if you book both workshops, for a total cost of only $321 INC GST. If you want to come to these workshops, then apply using the form below. 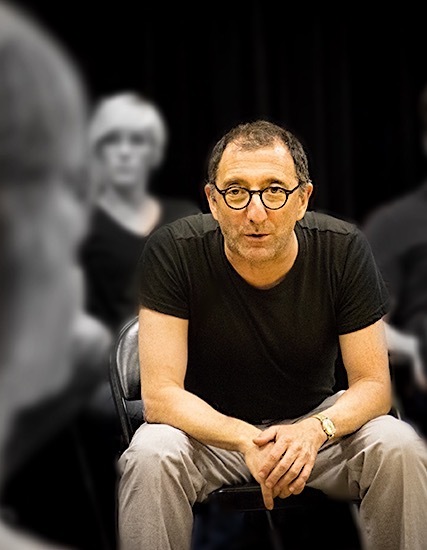 David Razowsky was Artistic Director of Second City LA for many years, and has worked as director, performer and in various consultancy roles with companies such as iO, Annoyance, Steppenwolf, Dreamworks, Whose Line Is It Anyway, and Amsterdam’s Boom Chicago. He was also a staff writer for The Simpsons Comic and The Simpsons Sunday, and of course directed and performed with the Second City main stage (with his fellow cast members including Steve Carrel, Stephen Colbert and Jeff Garlin) and Second City touring companies. He’s been called “the guru of improvisation, and an improvisor’s improvisor”, who connects mindfulness with improvisation’s core principals of being in the moment, taking care of your partner, and groundedness. Basically, he rocks, and his CV is way too long. Feel free to send this to anyone else who might be interested. But we recommend only after you’ve booked yourself in first! This entry was posted in Courses, News and tagged razowsky, workshop on 5 September, 2017 by Richard Bennett. This workshop has now finished. Gary Schwartz is coming to Sydney in June 2016 for two very special and unique workshops exploring the methods and work of Viola Spolin, who is often called the mother of improvisation. Gary began working with Spolin in 1977, is one of the few remaining people who have worked extensively with her, and is the only teacher endorsed by both Viola Spolin, and her son Paul Sills, founder of the legendary Compass Players and The Second City. Viola Spolin’s work is often greatly misunderstood as just a bunch of theatre games, so Gary has developed for us an initial 3 hour workshop covering the core principles, techniques and methods of Viola Spolin’s work, followed by a full weekend intensive for those who wish to continue exploring her work in more detail. This workshop follows on from the Spontaneity & Transformation workshop above, which is included in the cost of this workshop. Apply for these workshops at the bottom of this page! Viola Spolin’s work includes her ground breaking 1963 book Improvisation for the Theater, and many other books on acting, directing and improvisation over the following 30 years. If you’re an actor or improvisor, then you would have used her exercises in acting, improv or team building workshops or played her games on stage or with Theatresports. She made a huge contribution to acting and directing techniques that are used and taught in most acting schools around the world, and many schools even have curriculums based purely on her teachings. These workshops are a once in a lifetime opportunity to work with the next best thing to Viola Spolin herself, along with Gary’s unique take on his almost 40 years of Spolin training. They will include work on spontaneity, awareness, transformation, point of focus, freeing tension, dealing with subjective preconceptions, relationship, character, concentration, being in the moment and more. Both workshops are for all levels of experience, from no improvisation experience through to veteran players. He’s a successful long time director and actor of both scripted and improvised works, with performances in the Oscar award winning film Quest for Fire, and 65 episodes of the Emmy winning TV series Zoobilee Zoo. As a voice actor, Gary has worked with directors Robert Redford, Barbra Streisand, Tim Burton, Kenneth Brannagh and many others, as well as voicing hundreds of video games, TV series’ and film. Gary maintains Spolin Games Online a free internet video library of Spolin’s exercises, a resource for teachers, players and students. Gary’s acting career is detailed on IMDB, and his full bio can be found on his website. To apply for Spontaneity & Transformation, we require the full $70 INC GST to be paid in order to reserve your place. For Excursions into the Intuitive, we require an initial $70 INC GST deposit to reserve your place, with the remaining $280 INC GST to be paid by 1 June 2016 or your reservation will be cancelled. This entry was posted in Courses, News and tagged spolin on 3 May, 2016 by Richard Bennett. Hone your sketch comedy writing skills! This 6 week program is designed for writers, actors and improvisors of all experience levels. Learn basic scene structure, character development, establish action, and learn the styles and genres of comedy. Weekly writing assignments and in-class exercises generate material and establish a regular writing schedule. We’ll create a writer’s room, brainstorm ideas, create environment, write dialogue, work with story, write for the stage, and more. This course lays the foundation for writing comic scenes in the Chicago style of sketch writing. No previous experience is necessary, but experienced writers and performers will still get a lot out of this course. The program is lead by Tony Starr, a writer and improvisor who specialises in both written and improvised sketch, having trained in the Conservatory at Second City and UCB. He has spent many years in the L.A. sketch community and has been featured on Funny or Die, and written for iO West’s “Top Story Weekly”, The Second City’s “Second City This Week”, The Second City Show “Pretty in Pink Slips”, and video sketch team, Sketch Federation. This entry was posted in Courses, News on 12 October, 2015 by Richard Bennett. This workshop is now full, however we will be running another, so please contact us if you’re interested. 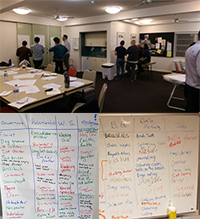 The first of it’s kind in Sydney, in this workshop you’ll learn how to develop sketches in the Chicago style, from improvised scenes to the written page. Learn traditional sketch formats such as “Center and Eccentrics”, “Clash of Context” and “Inappropriate Response” along with premise generation tools to help get the juices flowing to create, define, develop and script complete sketches. In addition to the fundamental core concepts, we’ll explore finding the game of the scene, heightening, finding bits, fleshing out character, and writing for the stage. The workshop will lead by Tony Starr, a writer and improvisor who specializes in both written and improvised sketch, having trained in the Conservatory at Second City and UCB. He has spent many years in the L.A. sketch community and has been featured on Funny or Die, and written for IO West’s “Top Story Weekly”, The Second City’s “Second City This Week”, The Second City Show “Pretty in Pink Slips”, and video sketch team, Sketch Federation. Some formal improvisation training is preferred, but contact us if unsure. This entry was posted in Courses, News on 13 August, 2015 by Richard Bennett. Quick link to apply for these workshops through our contact form. David Razowsky is doing a one off return to Sydney in July for 3 very special improvisation workshops. David is one of the top teachers of theatrical improvisation and acting, and is the most experienced Chicago improvisor ever to teach in Sydney. He had a huge impact on Sydney last year, with a number of groups forming around his work, and our long form community greatly improving in quality as a result of it. For David’s return visit, we’re offering 3 unique inner west evening workshops. The price is $70 INC GST per workshop. We’re also offering two special deals: 2 workshops for $120 INC GST, and all 3 workshops for $170 INC GST. These will be the only workshops he’ll be doing, and the only opportunity to work with him while he’s here. They will fill very quickly. If you want to come to these workshops, then apply through our contact form, or contact Richard Bennett directly. Minimum level of experience is roughly the first few levels of Impro Australia’s courses, or equivalent improvisation in acting experience, but David is pretty flexible. If you’ve done our Inside Long Form Improvisation course then you are uniquely positioned to get the most out of these workshops. David Razowsky was Artistic Director of Second City LA for many years, and has worked as director, performer and in various consultancy roles with companies such as iO, Annoyance, Steppenwolf, Dreamworks, Whose Line Is It Anyway, and Amsterdam’s Boom Chicago. He was also a staff writer for The Simpsons Comic and The Simpsons Sunday, and of course directed and performed with the Second City main stage (with cast members including Steve Carrel, Stephen Colbert and Jeff Garlin) and Second City touring companies. He’s been called “the guru of improvisation, and an improvisor’s improvisor”, who connects mindfulness with improvisation’s core principals of being in the moment, taking care of your partner, and groundedness. Basically, he rocks, and his CV is way too long. This entry was posted in Courses, News on 16 June, 2015 by Richard Bennett. This 6 week course will develop your skills in creating characters and relationships with depth, initiating and heightening scenes, and will give you extensive experience experimenting with and performing the La Ronde form. Upon completion, you will have a thorough understanding of the format and will have developed the ability to play deeper and more complex character and relationship focused scenes. This entry was posted in News on 3 February, 2015 by Richard Bennett. This fun and information rich course covers an extensive range of material, and will provide actors and improvisors with a more grounded, holistic and actor based approach to long form improvisation than is taught anywhere else. It will forever change the way you look at improv, even if you’ve already been doing it for years. This entry was posted in News on 2 February, 2015 by Richard Bennett.